Attic Threads & Quilts: 2018 Mystery Quilt - Diamonds are a Quilter's Best Friend! 2018 Mystery Quilt - Diamonds are a Quilter's Best Friend! Layer Cake? Do you, like me, have a few layer cakes in your stash? Do you take them out and pet them every so often? Well, it’s time to dig one out! This year’s Mystery Quilt is based on a Layer Cake. It’s time to stop saving them and start using them to create works of art! 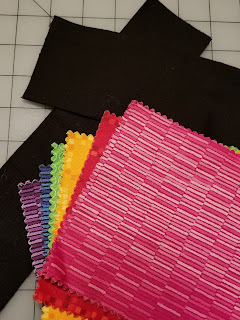 Don’t worry, if you don’t have a layer cake, just can’t turn loose of one or prefer to make a scrappy quilt, not a problem. 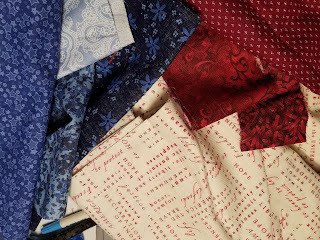 In the Mystery Quilt, I will also be providing the information you need to create a Scrappy Quilt. This Quilt is the perfect size for Quilts of Valor. The finished size, without any borders is 60”x70”. Borders will be up to you. Although I will be give some suggestions with the final directions. 8 of the layer cake squares, perfect for a matching pillow case! Note: it is scrappy, so you can add fabrics as needed. I used lots of different reds and blues. I had yards of the white w/red print, so I used it for my background.